Poor Seth Rogen. He just wants to be a cool, bearded, sorta-funny sorta-lame dad! And then his life of dad-jokes is interrupted by that incorrigible Efron boy and his Animal House meets Jackass shenanigans! 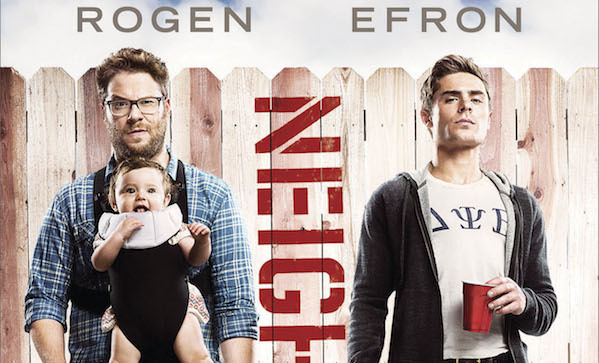 In case you missed it, Neighbors is a movie about a young family living next to a frat house in a universe where repeated assault is legal—which is good, because a realistic portrayal wouldn’t be very funny. Anyway, the DVD/Blu-Ray comes out on September 23, and we’re celebrating by giving away five copies! How can you get yours? Sign up for our newsletter below, and we’ll choose winners this Friday.